Am interested in buying artworks from your esteemed organization for my new apartment and you still have for sale and i will be glad if you can Send me recent art work you have for sale with the asking prices,also my method of payment is by (BANK CHECK) as means of payment. Kindly email me some of the artwork you have in stock with the name and prices now. Looking forward to an early response. Amy Marx reviews Phyllis Plattner at The Katzen Center at American University - hurry to see this show, as it ends March 15! In 1814 Francisco Goya painted “The Shootings of the Third of May 1808 in Madrid.” It is a gut-wrenching portrayal of a man with arms upraised before a firing squad. He has an expression of horror on his face. His comrades lie in a bloody heap at his feet. Goya’s emotionally charged depiction of this man’s last minutes of life was unprecedented. 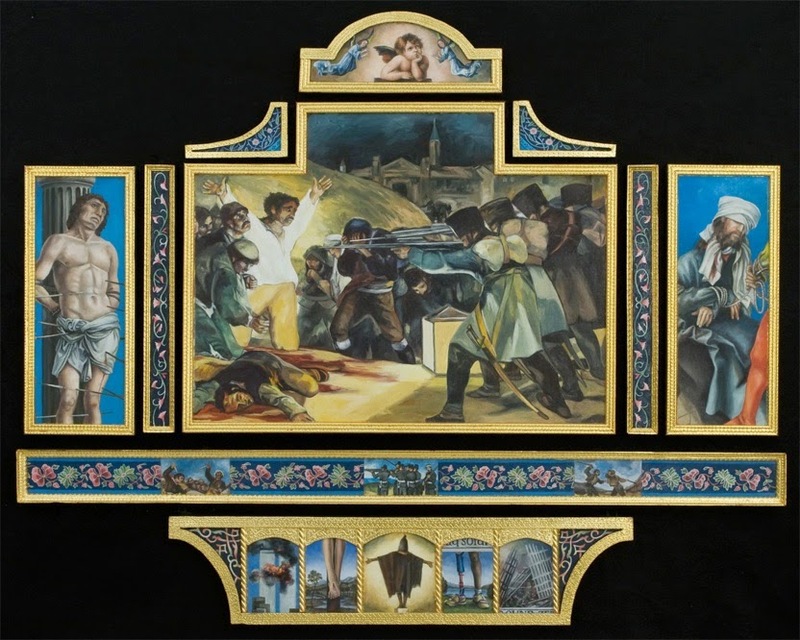 The painting graphically illustrates the Spanish resistance to Napoleon's invasion and occupation in the Peninsular War. Art historian Kenneth Clark has said this is "the first great picture that can be called revolutionary in every sense of the word, in style, in subject, and in intention". In 2001 Phyllis Plattner began the creation of a series of artworks in which she made meticulously rendered copies of art historical paintings in the style of the original artist, and photographs culled from newspapers and magazines. In “Chronicles of War, Saints and Martyrs” she utilized Goya’s historic painting, mentioned above, and amplified its effect. She placed Goya’s painting in the center of a sixteen-paneled piece. To the left of Goya’s work is the arrow-pierced Saint Sebastian, an early Christian martyr (288 AD) from “ The Martyrdom of Saint Sebastian” by Andrea Mantegna, (1480). On the right is Christ, blindfolded and bound, about to be scourged, painted by Van der Weyden, (1450). 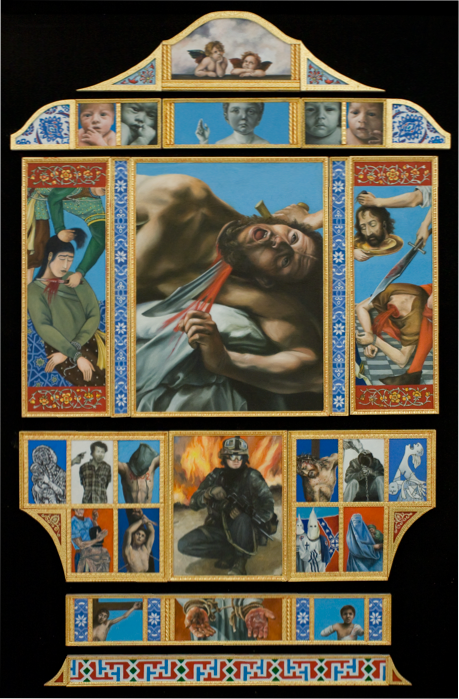 Further heightening the effect of “Chronicles of War, Saints and Martyrs” is a horizontal row of images along the bottom, a format known as predella panels. From left to right are painted the following: The Twin Towers ablaze on September 11, Christ’s feet nailed to the cross, the well known image of an inmate in Abu Ghraib, a World War Two survivor with a prosthetic leg, and finally the tangled heap of stainless steel, a ghostlike cathedral, the remains of the World Trade Center. A cherub from Raphael’s Sistine Madonna glances heavenward atop all of this with additional angels on either side. And there’s more, even in this one piece. Originally published in Dimensions magazine - 1997. When photography first attempted to enter the world of fine art, the museums and arts intelligentsia alike rudely rejected it, but it was accepted by the public. Today, the computer is attempting to enter the sterile white walls of the Washington power galleries and museums, but unlike photography, it seems to be allied with the insiders in the world of art, who seem enamoured with the digital world of art. "Exhibiting the Digital Atelier: Prints by Unique Editions and Participating Artists," is a powerful groundbreaking exhibition at George Washington University Dimock Gallery, curated by Mary Ann Kearns. So far, digital (in Washington circles) usually means Iris prints, and owners of these pricey printers, such as Chris Foley and David Adamson, have made quite an impact upon the local art scene by the creation of huge, beautiful Iris prints from standard photographic images. Controversy, caused by lack of data on conservation standards and misinformation, heavily cloud the image (pun intended) of Iris prints, yet photographers like Amy Lamb and Susan Rubin have delivered, huge beautiful works which make us gasp at the beautiful, ethereal, marriage of photography and technology. This exhibition attempts to push the digital envelope. It focuses on the marriage of software, hardware and creativity: the pencil neck geek meets the angst-ridden, socially conscious artist! The show's primary focus is a collaboration of five artists: Helen Golden, Bonny Lhotka, Judith Moncrieff, Dorothy Simpson Krause and Karin Schminke. They translate their printmaking, photographic and painting skills to the digital world to deliver "fine art in limited editions." In addition to these five artists, several other local artists were chosen from a digital workshop held during the summer at the National Museum of American Art. These artists are Cynthia Alderdice, Danny Conant, Andras Nagy, Linda Mott-Smith, Howard Bagley, Grace Taylor, Patrick Lichty and Lynn Putney. And it is two photographers among this last group, Danny Conant and Grace Taylor, who steal the show! Conant's mastery of photography is as well known as are her beautiful infrared nudes or fragile Polaroid transfers - she is able to transfer her immense photographic abilities, as does Taylor, to this new media in an effective, creative way. This, unfortunately, makes many of the other images in the exhibition look like fancy web pages. I must be honest, I had mixed feelings about the exhibition, and perhaps my opinion is clouded by my own background (I have degrees in Fine Art and also in Computer Science). Another perhaps is that I am essentially prejudiced in attempting to see creative beauty in the color of a pixel as painted by a bubble jet printer or a laser printer or an Iris printer, as compared to the beauty of a Van Gogh brushstroke, or an Escher etching or the crisp white of a cloud in an Ansel Adams print. It is nonetheless a seminal exhibition in its field, and I recommend it! The show hangs December 11, 1997- January 30, 1998 at the Dimock Gallery of GWU, 21st and H Streets, NW in Washington (202) 994-1525.